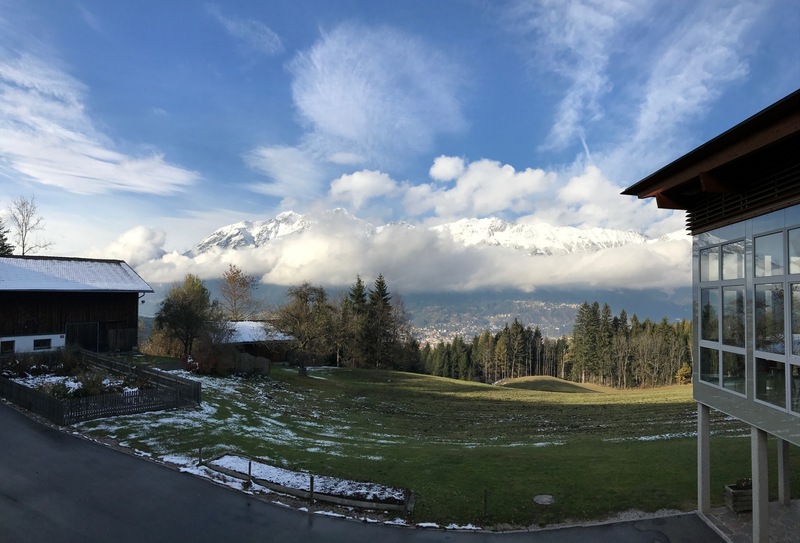 From the 8th until the 11th of November a group of 13 people from the KIT went to Innsbruck to participate in the 9th Workshop on Numerical Analysis of Evolution Equations. It took place at the Bildungsinstitut Grillhof in Vill, just outside Innsbruck. The nice location with amazing views on Innsbruck and its surrounding mountains and the great food provided the perfect environment for a successful workshop. View from conference location, taken by Simone Buchholz. The ‘Divide and Conquer’-principle was already used in the Roman foreign policy. The politicians and warlords of the ancient world noticed that a large group of people can be easier controlled or even conquered if you split them up into several smaller groups. Luckily the ancient times are long gone, but the principle remains, in particular in computer science. Many algorithms are based on the idea of splitting a task into several easy-to-handle parts. After solving these simpler parts, the solution of the full problem needs to be reconstructed from the solutions of these subproblems. So, it is possible to ‘conquer’ a complex task. A famous example is the well-known Quicksort algorithm to sort a list of numbers. You start by picking one number in the list (the pivot element) and compare it to every other number of the list. If the other number is smaller, we put it on the left side of our pivot element, if it is larger, we put it on the right side. Thus, we get two sublists, one with smaller and one with larger numbers than the pivot element. We continue to sort these sublists in the same way with new pivot numbers from the sublists. The complete list is sorted when all sublists are sorted. You may wonder what this is all about and how this is related to our CRC? Together with one of the organizers, Roland Schnaubelt, and the invited speaker Peer Kunstmann, Martin Spitz and I participated in the 10th Euro-Maghrebian Workshop on Evolution Equations. This series of workshops was initiated in 1999 with the aim of bringing together mathematicians from Europe and the Maghreb working on evolution equations, the first one having taken place in Marrakesh, Morocco. This time the scientists met in the small city Blaubeuren, Germany, located close to Ulm in the eastern Swabian Alb. The location of the workshop was the Heinrich-Fabri Institute of the university of Tübingen. It provided us with pleasant accommodation and a well-equipped lecture room. During the breaks many lively discussions between the participants developed and the nature in the surrounding, including the famous Blautopf, invited to go for walks. Evolution equations, the topic of the workshop, arise naturally in many sciences like physics, chemistry and biology. They appear whenever the time rate of change of a quantity (e.g. a temperature, a mass concentration or a density of a population) depends only on the present state of the quantity. This covers a wide range of natural phenomena and leads to many different scientific questions. During the workshop three lecture series were held, each of them consisting of three talks. Thierry Cazenave from Paris spoke about Finite time blowup in nonlinear heat, Schrödinger, and Ginzburg-Landau equation. He talked about the analysis of the first two equations and how to combine the properties of their solutions in the investigation of the solutions to the last equation. Mourad Choulli from Metz gave a lecture series about Elliptic and parabolic Cauchy problems. He was mainly concerned with stability estimates for the elliptic case and the extension of their proofs to the more complicated parabolic situation. Jürgen Saal from Düsseldorf gave insights into Systematizing the maximal regularity approach to quasilinear mixed order systems. He talked about the Newton polygon approach and anisotropic function spaces and their application to free boundary value problems. These three minicourses were accompanied by nine invited lecturers and about 20 contributed talks by the participants from Europe and Northern Africa on various topics concerning evolution equations, functional analysis, partial differential equations and inverse problems. 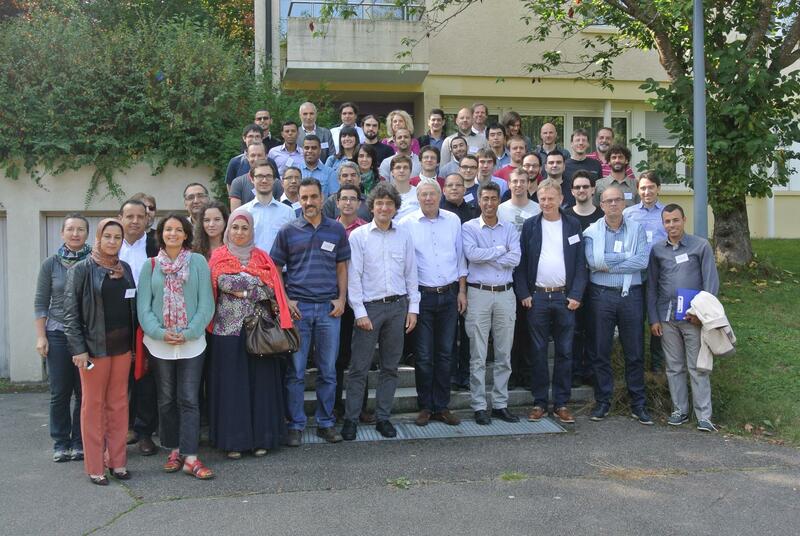 Conference photo of the 10th Euro-Maghrebian Workshop on Evolution Equations in Blaubeuren. 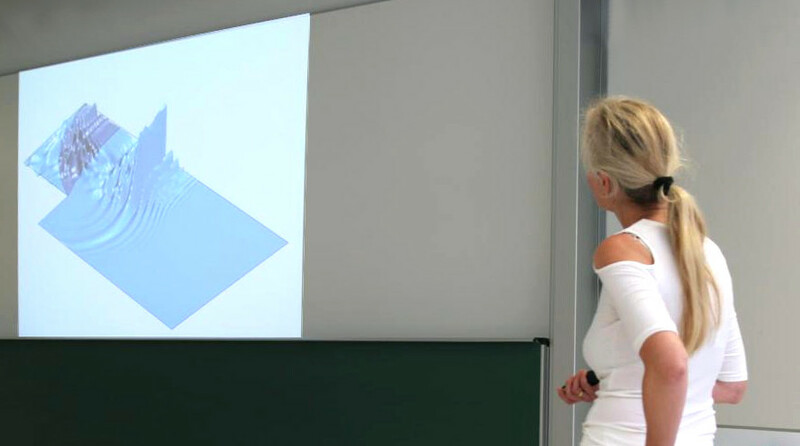 The CRC recently held a summer school on wave phenomena in Karlsruhe bringing 53 participants from 12 countries around the world to Karlsruhe to focus on their shared interest in and faszination of wave phenomena. I personally recently took part in a conference in Italy (IMSE) leading some friends and family to ask me, what a conference or summer school amongst mathematicians is like. Since you might be thinking about a future in academic research yourself, while you read this, I want to take some time to tell you a little bit about what my experiences with these two formats have been and what they offer to you as a student or young researcher.